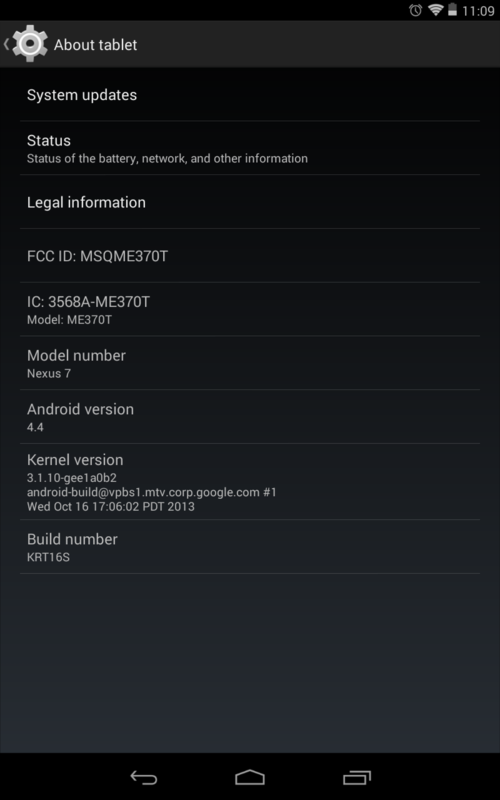 The first notable update for KitKat has just been released across most of the major AOSP and Nexus channels. According to Google software engineer Conley Owens, the KRT16S build includes bugfixes for the original Nexus 7 and Nexus 7 2013 (WiFi and mobile versions), Nexus 4, and Nexus 10. The binaries have already been added to the Nexus repository. Google has also updated the factory images for the relevant Nexus devices. You can see the full list here, or follow the links for the Nexus 7 WiFi, Nexus 7 Mobile, N7 2013 WiFi, N7 2013 Mobile, Nexus 4, and Nexus 10. 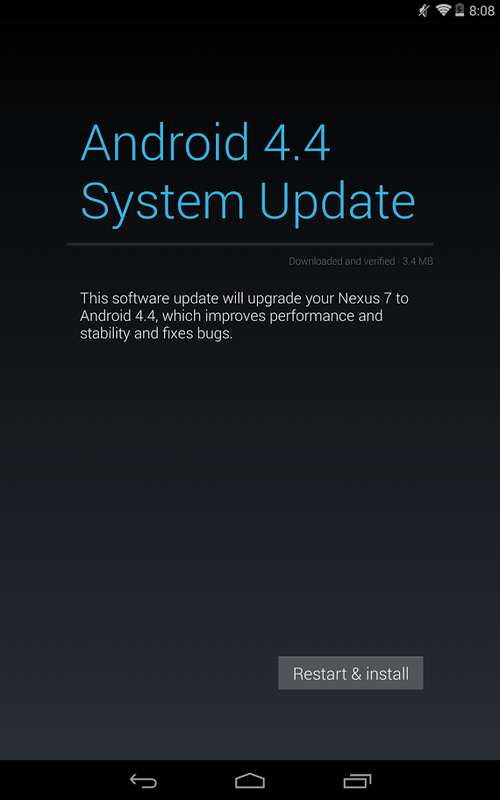 The original Nexus 7 3G and the Nexus 4 still haven't gotten their over-the-air update to Android 4.4 yet, so it's possible that Google could skip the initial build (KRT16O) and go straight to the latest version. 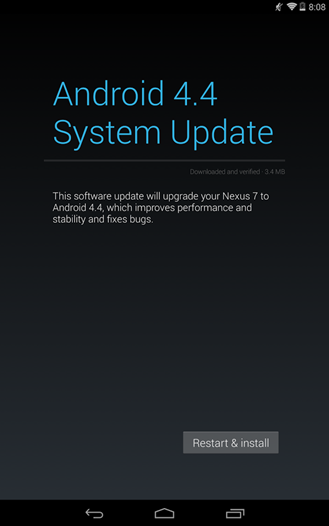 Some users are already seeing OTA updates. Kernel source code for Flo, Manta, Mako, Grouper, and Razor builds are already available. 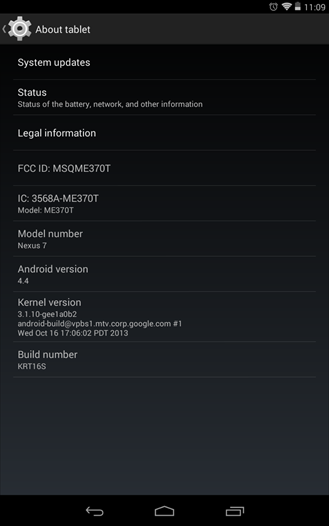 So far there's no word on exactly what's been changed in the latest build, but odds are that having access to a feedback from a few million users helped Google to iron out the kinks in KitKat's debut. Naturally we'll be diving in, and we'll report on any significant changes. 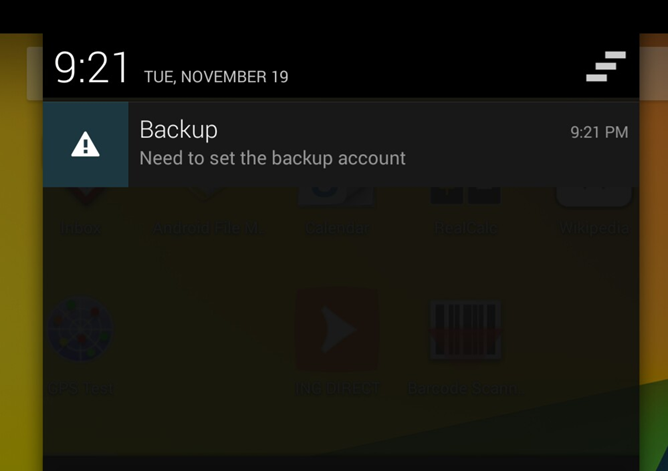 At least one important change has already been sent in by a tipster: your device may ask you to specify a backup account if you have multiple Google accounts on the device. Update: Here is the KRT16O -> KRT16S AOSP changelog. Not sure which one (according to Dan Morrill, there was one stop-ship bug) of these was so critical that it delayed the OTA for the Nexus 4 and several other Nexus devices, but here they all are. The vold bugs look pretty serious, and the rest seem APN-related.